Dating from the 16th Century, charming West Down House is situated in a small rural hamlet just over a mile from the ancient village of Bradworthy on the north Devon and Cornwall border. The manor house retains fascinating features from the days it was occupied by local gentry. This romantic retreat offers a spacious holiday apartment in the manor house and three adjoining, enchanting holiday cottages. All properties provide a high standard of accommodation and sleep from two to four persons (plus cot in larger four person properties). Properties are inspected annually by our letting agents. Explore this quiet, unspoilt corner of northwest Devon close to the breathtaking north Devon and Cornwall coastline with its fishing, smuggling and shipwrecking history. 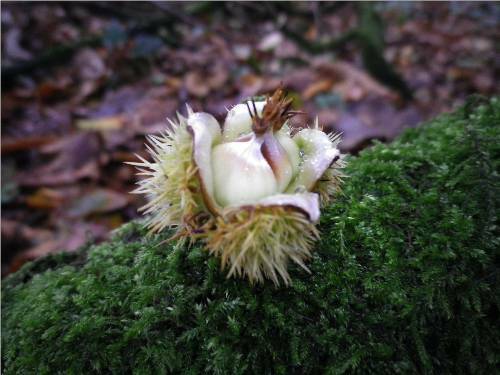 Meander along quiet winding country lanes with their characteristic high, wildflower-rich hedgerows known as Devon banks. Discover some of the most dramatic and beautiful scenery in the country with diverse landscapes, uncrowded villages, hamlets, coves and beaches. Sample fresh local produce and spoil yourself with a traditonal Devonshire cream tea. Sandymouth, the closest beach (National Trust), is about ten minutes drive. Bude with shops, restaurants, golf, indoor leisure pool, horse riding and sandy surfing beaches is just over 9 miles. The small market town of Holsworthy is 8 miles whilst world famous Clovelly is 9 miles. 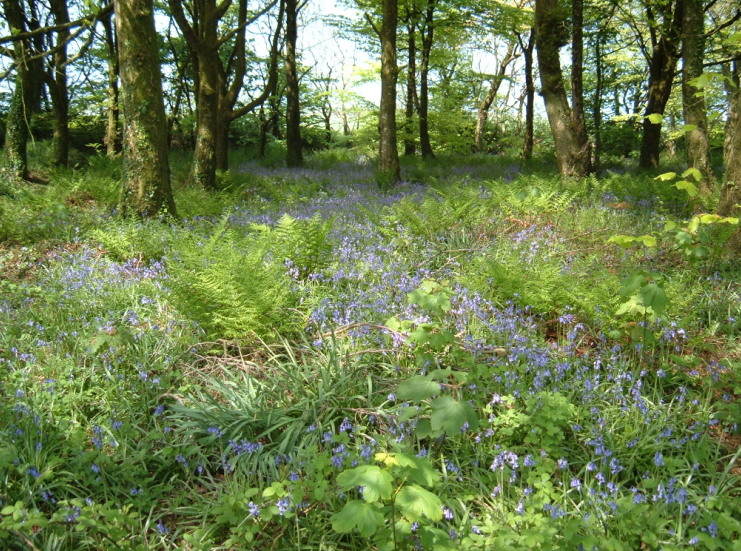 Upper and Lower Tamar Lakes (2 miles) are a wonderful setting for water-sports, fishing, birdwatching, walking and picnics. Nearby the Tarka Trail and the Camel Trail offer traffic-free cycling and walking. 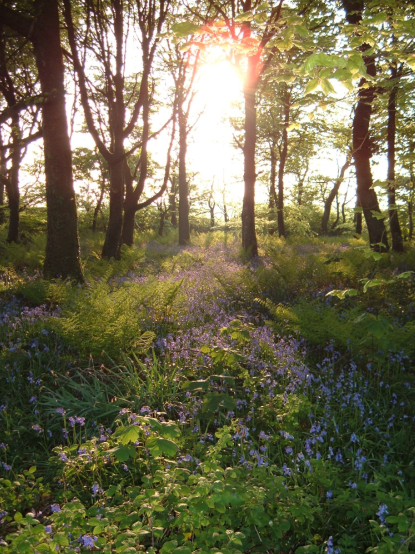 Dartmoor, Bodmin Moor and Exmoor are within a comfortable drive. The South West Way along this Heritage Coast offers lovely walks with spectacular views. National Cycle Network Route 3 passes through the area. Horseriding, cycling, swimming, fishing and golf are available locally. 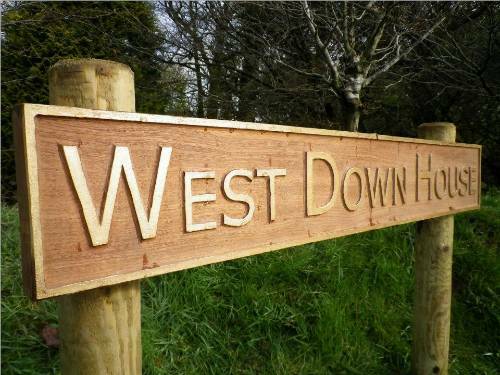 SPECIAL OFFERS Please visit http://www.westdownhouse.co.uk/tariff for some periodic special offers on our holiday cottages. 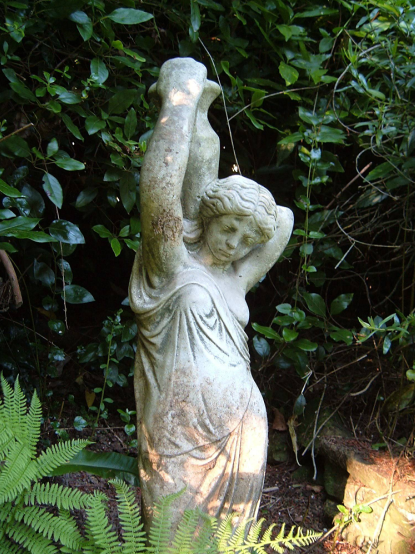 The Sculpture Gardens and gallery here at West Down House are popular. We have many lovely sculptures and artworks by talented artists some examples of which can be seen at http://www.facebook.com/Devoncottages. The sculptures are available to buy or the artists can be contacted through us to commission new work. Artwork may be viewed by appointment (also non-residents). Bradworthy, the nearest village, is a unique thriving and friendly rural community. 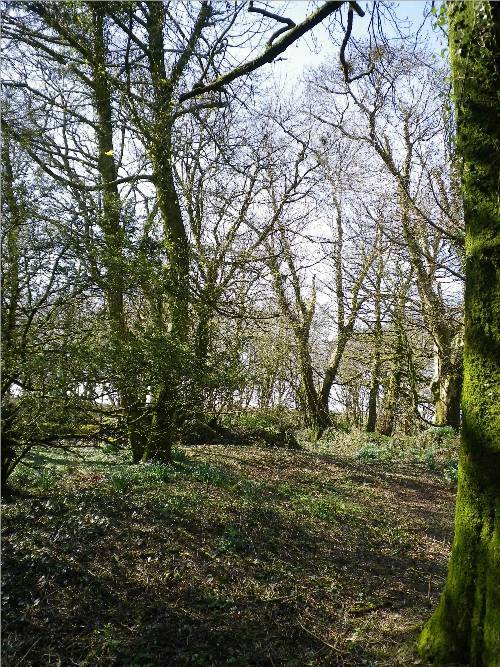 Dating from Anglo Saxon times Bradworthy has a delightful ancient square, one of the largest in the West Country. The village offers shops (grocers, butchers, general store and furniture store), garage (with fuel), pub (an old coaching inn with food, dining area and beer garden) and post office. The coast is about a 10-15 minute drive away. 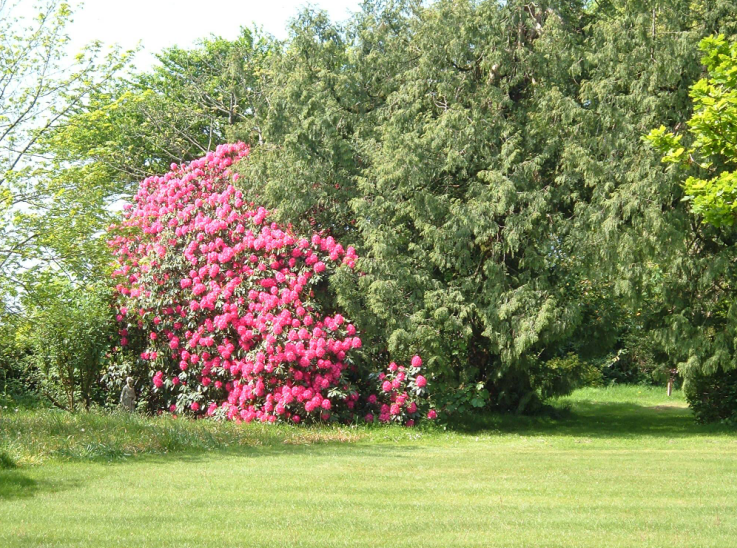 The properties are set in over five acres of lovely gardens in this quiet and unspoilt corner of Devon. The grounds include swimming pool, barbecue, extensive lawns, shrubbery and woodland with an abundance of wildlife and plants. 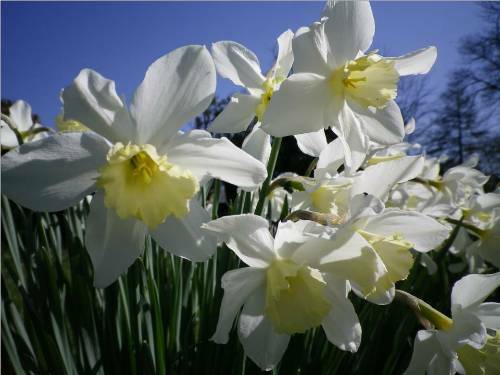 During spring we have a beautiful display of naturalised bulbs and primroses followed by bluebells, azaleas and rhododendrons. Guests often marvel at the open vistas ("big sky") and the panoramic views towards Dartmoor and Bodmin Moor across gently rolling countryside. 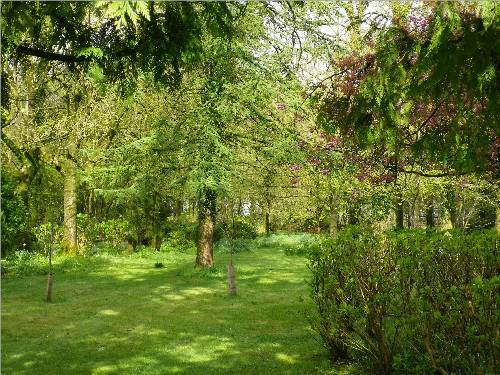 You are welcome to enjoy the gardens with over five acres of extensive lawns, sculpture, shrubbery, woodland and swimming pool. We understand that the "Googly" or "Bosie", a bowling action used in cricket, was developed and perfected on our front lawn by Bernard James Tindall Bosanquet, a cousin of the Bosanquet family that lived here in Victorian Times. 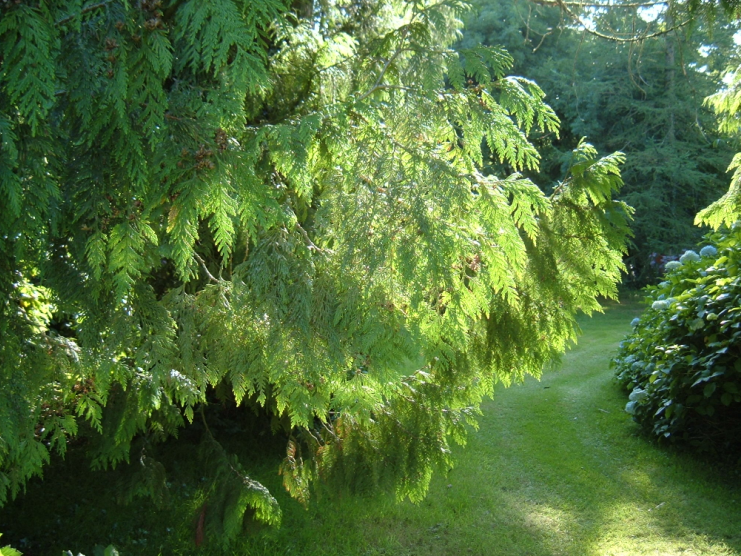 The grounds are an interesting and peaceful place in which to wander or sit with many quiet and hidden corners and an abundance of wildlife and plants. 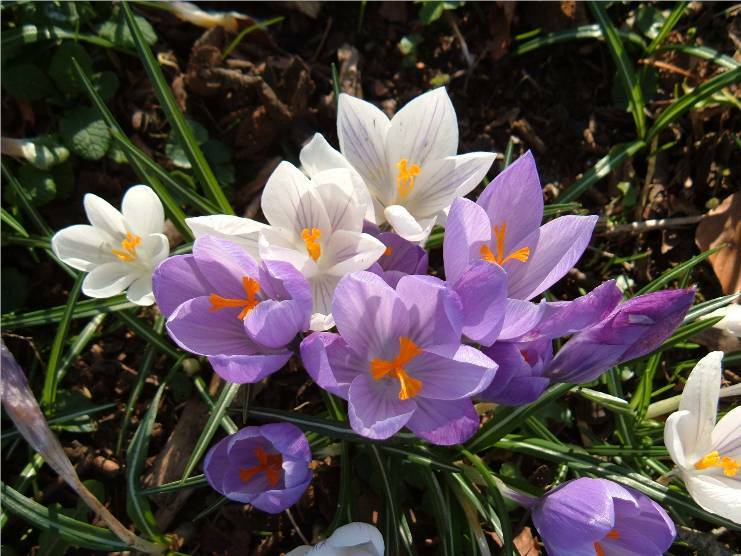 During spring we have a beautiful display of naturalised bulbs, first snowdrops, then crocuses and daffodils together with wood anemone and primroses. 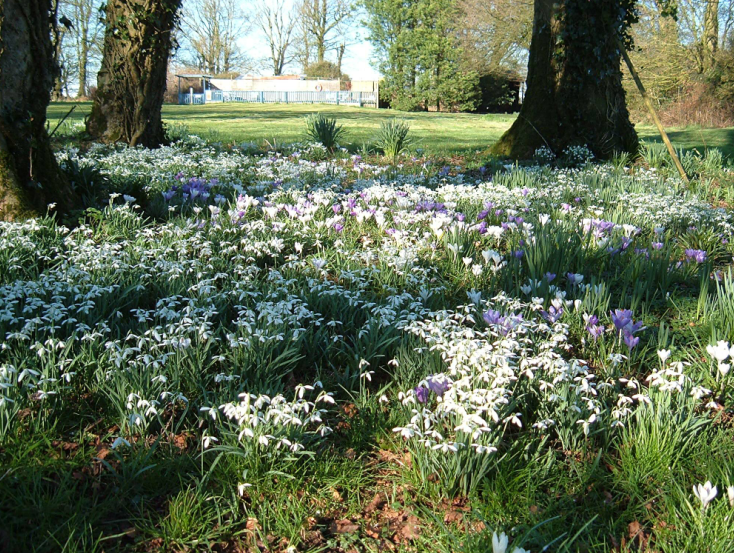 These are followed by a colourful display of bluebells, azaleas, cherry trees and rhododendrons. We also have colourful fuchsia and escallonia hedges and Welsh poppy displays. 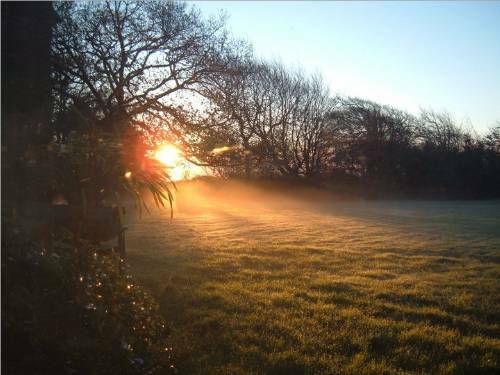 The grounds offer panoramic rural views of over 20 miles into Devon and Cornwall so that Dartmoor and Bodmin Moor can be seen across unspoilt gently rolling countryside. Relax with a picnic in the grounds or use the barbecue to cook delicious local produce such as home cured sausages and burgers. Watch the sun going down and experience one of the many spectacular sunsets we get during the year. On clear nights the visibility of the night sky is amazing and offers views of seemingly infinte stars, planets and passing satellites. We have seen many shooting stars and meteors. We are located in one of the last few remaining dark sky areas of the country. Being unspoilt by light pollution one astronomer has described us as a site ideal for stargazing. Occasionally you may glimpse a deer or hare in the garden. Other shy visitors include hedgehogs, bank voles, moles, foxes, field mice, shrews, bats, frogs, slow worms, lizards, toads and newts. Watch graceful buzzards circling high overhead making their distinctive crying or mewing sound. In spring spotted flycatchers and swallows return to nest. Enjoy the swallows and swifts as they dive and weave about catching insects and occasionally take a drink on the wing from the swimming pool. Other birds that visit us include woodpeckers (can be heard drumming on wood), pheasant, owls (hooting at night), nuthatch, treecreepers, house sparrows, goldcrest, blackbirds, thrushes, goldfinch, greenfinch, chaffinch, robins, pied wagtail, cuckoo, collared doves, wood pigeon, dunnocks, magpies, wrens, crows and starlings. More unusual visitors and migrants include snipe, hoopoe, hawks and grey wagtail. 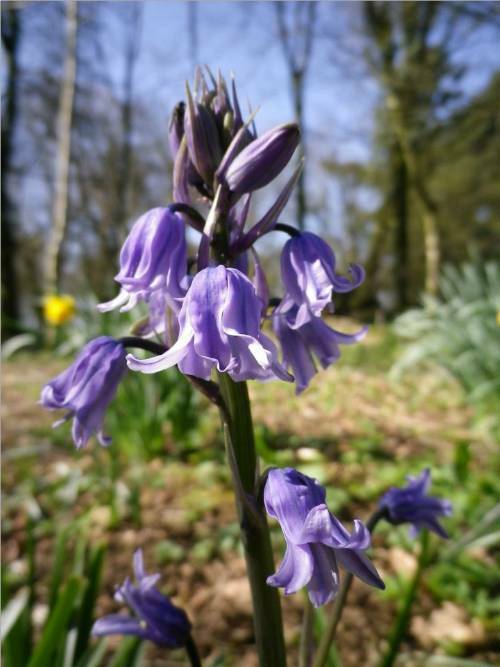 We also try to encourage butterflies and insects with the shrubs and plants we have planted in the grounds and by leaving certain areas untouched and wild. Our holiday cottages and apartment are available for rent throughout the year. Short break holidays are available out of the high season. Please contact us for details or should you have any special requirements. The Butler's Pantry, the Groom's Cottage and the Coach House. Our holiday properties are tastefully furnished with sympathetic furnishings, furniture and ornaments to provide a comfortable, relaxing and homely atmosphere. Properties have either double four-poster beds in the main bedroom (Butler's Pantry and Manor Suite) or antique style pine beds (Grooms Cottage and Coach House) and twin beds in the second bedroom where applicable. The Butler's Pantry sleeps two adults only and has an open tread spiral staircase and large inglenook fireplace. The other properties sleep from two to four maximum (plus cot). The accommodation is well heated with both electric convector heaters and storage heaters. The Butler's Pantry, The Groom's Cottage and The Coach House have log burning stoves. The Coach House also has full central heating. The Manor Suite apartment has a coal effect real flame gas fire. Hot water is provided by immersion heater (and also by central heating in The Coach House). Electricity and gas are included in the tariff. Solid fuel may be purchased as needed, either locally, or from us (subject to availability). There is ample off-road parking, payphone, barbecue and a laundry area with coin operated washing machine and tumble dryer. All properties have local information folders and brochures showing local places of interest and attractions. There is a selection of reading books in each property. Regretfully pets are not allowed (for the comfort of guests with pet allergies and also due to owner's allergy). You can relax on the sun terrace surrounding the sheltered, solar-heated swimming pool. The fenced, unsupervised pool (30 by 18 feet and four feet deep or 9.1m by 5.5m by 1.2m) offers refreshing enjoyment for all the family (open May to September subject to closure due to unforseen and routine maintenance). Guest laundry room (with £1 coin operated washing machine & tumble dryer, sink and ironing facilities). Free wifi access on site. Barbecue available for use by guests. Bed linen and towels included in tariff (please bring your own beach/swimming towels). Cots and highchairs available if required. Gas and electricity included. Solid fuel may be purchased from us (subject to availability) or locally. Information packs, leaflets and a selection of reading books are provided in each property. Regretfully pets are not allowed for the comfort of guests with allergies (and due to owner's allergy). Local kennelling may be available. West Down House has its own private treated water supply which is monitored by Torridge District Council. Gas and oil equipment, water supply, portable electrical appliances and fire extinguishers are inspected regularly by members of the relevant bodies concerned (e.g. Gas Safe, OFTEC, Local Council etc). A delightful, romantic and cosy cottage that sleeps two adults only. The Butlers Pantry is unique and popular for honeymoons, anniversaries, birthdays and for other special occasions.